Last but not least, I want to talk about a very rare reptile that can be found in the UK at only a handful of heaths across southern England. Most people may know about adders and grass snakes, but mention the smooth snake and many people won’t have heard of them. We are incredibly lucky in the Thames Basin Heaths to have a chance (albeit a very slim one!) of seeing these snakes in the wild, with small populations existing in Hampshire and Surrey. But why is this snake so difficult to find? Aside from having a very restricted range, these reptiles are very secretive, hardly ever basking out in the open where you might find other snakes. They love to hide under logs, rocks and debris amongst the heather, rather than expose themselves to potential predators. This keeps them safe and out of sight, but is also the perfect spot to hunt their favourite prey, lizards and small rodents, which are captured and constricted in its coils. The smooth snake earns its name from being, well, smooth. Adders and grass snakes have a keel along individual scales, whereas the smooth snake lacks this ridge. If you come across a shed snake skin, have a look at the scales and the keel (or lack of) should be quite obvious! Like the sand lizard, these snakes have high levels of legal protection, and must be left undisturbed – so if you do see one, appreciate them from a distance! I hope you have enjoyed reading these reptile blogs as much as I have enjoyed writing them! 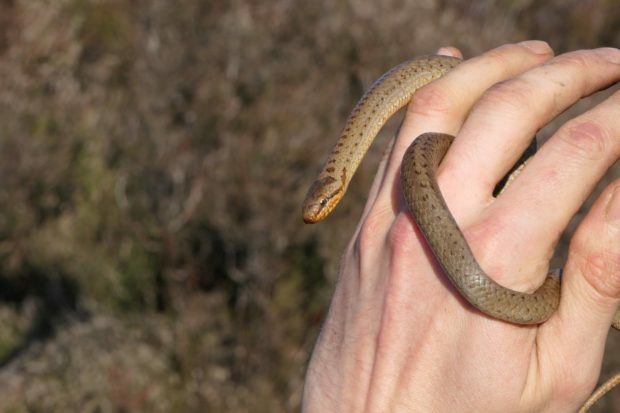 Reptiles can be found all over our heathlands, woods, grasslands, and even gardens. So next time you’re out on a sunny morning, slow down, scan along the edge of the path, listen out for some rustling, and you may get lucky! I’ll be back in the near future so look out for blogs on how you can become a wildlife scientist this summer. Is it a snake, is it a worm? No, it’s a lizard!